We hope to maintain a semblance of control of the chaotic, asynchronous processes our world is composed of. Rholang, a language of reflective process calculus, offers that promise. While utterly simple—not unlike quantum logic, which is also simple and general—application of the process calculus can prove to be difficult to understand. “Rholang is simple but not easy.” MacRhoLang @RHO-bot on Discord aims to make it more accessible. @RHO-bot enables simple client-side programming of functions to be performed on RChain test nets in a collaborative development environment that includes users. Chatbots are a leading means of managing distributed systems. 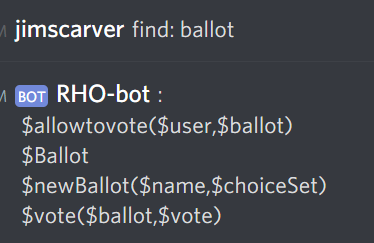 @RHO-bot in the CoLab Discord chat allows us to interface with an RChain node (rhobot.net, soon to be on testnet) in a language we cooperatively define. 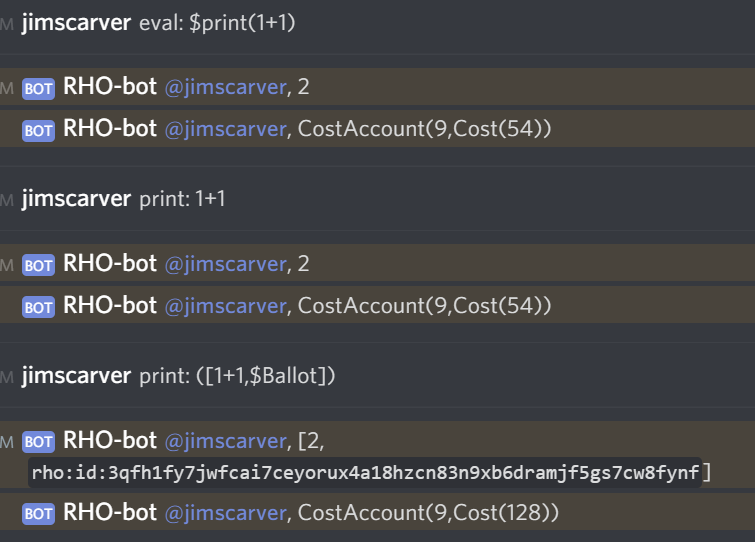 We define macros of parameterized Rholang snippets, allowing them to be used like user-defined commands, functions, or variables generating code to be run on RChain serving the chat community on a Discord server. 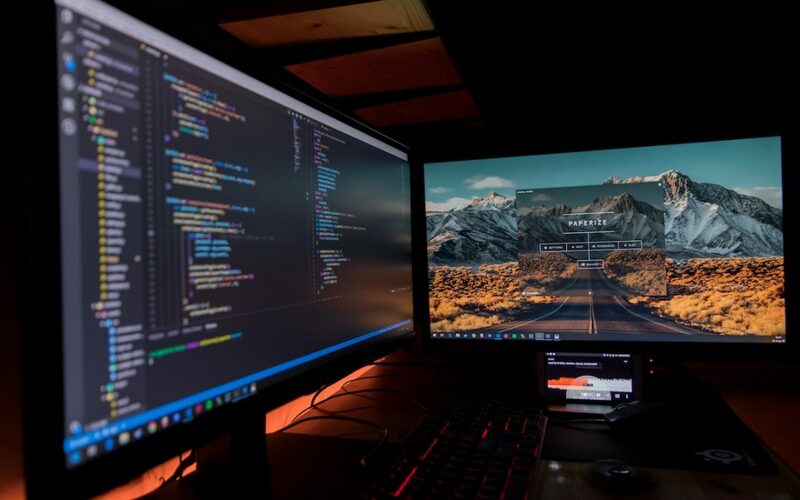 It employs Discord identities to create toy private and public keys, enabling demonstration of contracts running on RChain with a simple command interface. An environment is created where we can learn to share our capabilities and orchestrate our processes safely on RChain. It is an arena where the mystery of process calculus might be gently revealed. @RHO-bot is a work in progress being cooperatively constructed in the CoLab , currently employing the cpp macro preprocessor and clang-format formatter for Rholang on RChain with a discord.js chatbot. @RHO-bot is running on rhobot.net. We evolve the language of rho-bot by defining macros; there are inevitable bugs we can help each other fix as we learn together. The source code is on github. Expands global macros (excluding personal macros such as private key) and posts the result to the channel. To echo macros without posting in a public channel, you can direct message @RHO-bot but most other operations should be done transparently in a shared environment. e.g. in the #testing-bots channel. Expands macros, if any, and then executes the resulting Rholang code and posts result from the log in the channel. Macros can also be executed as global user defined commands. All macros in macrholang must begin with a dollar sign to avoid most of the well-known pitfalls of the cpp processor; the dollar sign will be flagged as an illegal character in Rholang, catching macros that failed to expand. In a shared environment like the CoLab, rhobot.net defines should be done transparently in a public channel so conflicts may be avoided or discovered, diagnosed and remediated. Carefully choose macro and contract names already in use for a new purpose. Use the find command to see what is already defined. No arguments. Deploys the tuple space of the last thing you evaluated on RChain. No arguments. Proposes a block consisting of prior deploys from any user. Discord identities are mapped to @dcks’s toy identities used in his private data Locker contract. These values are defined dynamically by @RHO-bot to reflect the user that executed the macrolang code. The values are automatically defined by @RHO-bot for the user executing macrolang code. We communicate with other members through their write only public mailbox (inbox.rho). We can send messages that may include capabilities granting access rights such as the right to vote on a ballot. send: “username”, “type”, “subtype”, data…. Advanced users can take advantage use other preprocessor functions besides simple macro substitution. #if, #include or any other cpp directive including any header and conditionals may be used anywhere in macrolang code on a line by themselves. Client side logic may be implemented using #if conditional expressions. Use #include to include rholang and macholang files anywhere in your code on rhobot,net or your machine. Discord messages are limited to 2,000 characters. While it is a good practice to limit programs to that size, there may be many programs in an app file. #include must be used for code longer than 2,000 characters. 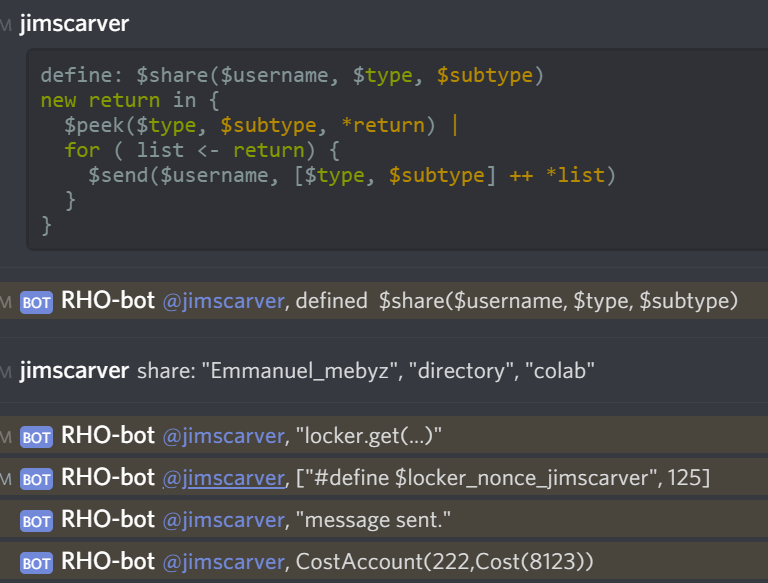 Define your macros in a colab channel in Discord like #testing-bots and in direct messages to @RHO-bot or fork the code on github and create your own bot. You can get help in the CoLab. You can join the CoLab here. Add your app to this document. Programming for the masses has largely become customizing copy/pasted code. To reuse code from existing defined macros search for “define $macroname” and copy the code from the most recent. Macro definition allow us to parameterize copied code, adding to our language a tool that reuses code for any parameters. To see all the Rholang generated, use the echo command; if that includes values that will change, it may break if copied and reused in a different or changed environment. To learn more about RChain visit RChain.coop. I suggest there is good reason to get some skin in the game. Your own @RHO-bot can put you in control.